Sorry for the bad pun, I had a few others too - "You comPleat me" and "Pretty pleats"! This post was inspired by my recent purchase of the black pleated baby doll dress pictured above. I went into a local second hand clothing store Missy's Room and took a few items into the changing room. All of my picks were bad, but already hanging in the changing room waiting for me was this dress. I tried it on and it was perfect, basically the dress picked me! I've always loved pleats and believe I don't own enough, so this this dress is a good start. 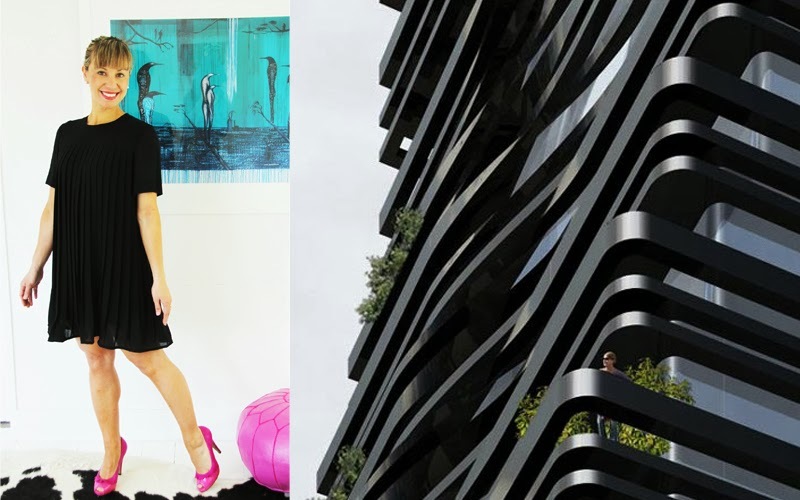 This black sculptural building above is a New York residential tower designed by Dutch architect Ben van Berkel of UNStudio. The wrapped black metal bands around the building form the balconies, terraces and shades creating interest, function and form. A perfect comparison with our fabric fashion pleats. There is a sense of elegance to pleats, the folds in fabric and structure provide a 3-dimensional element of depth, contrast and allure. The dimensions of that pleated and folded origami look is sophisticated and implies a level of craft and care in design and construction. White pleats are so chic and classy. 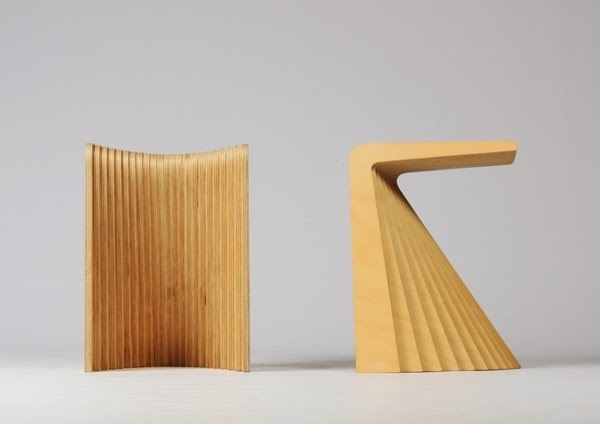 This beautiful chair by Raw Edges is sculptural and luxurious. 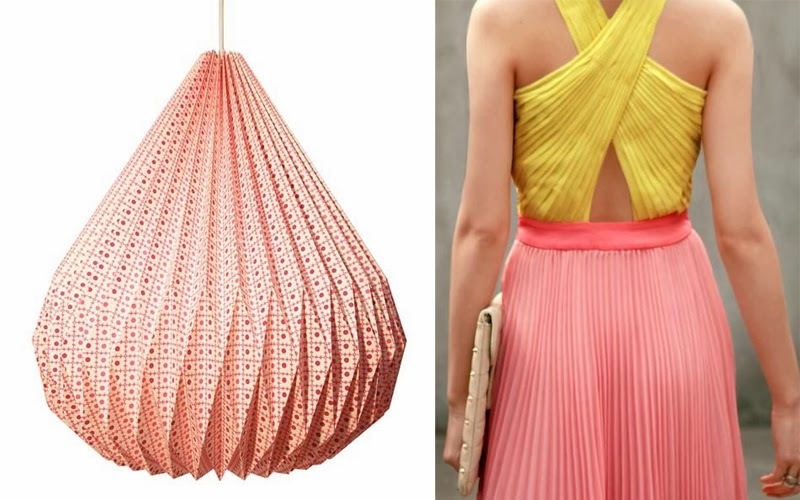 Soft pink shades of precise and elegant pleated folds. 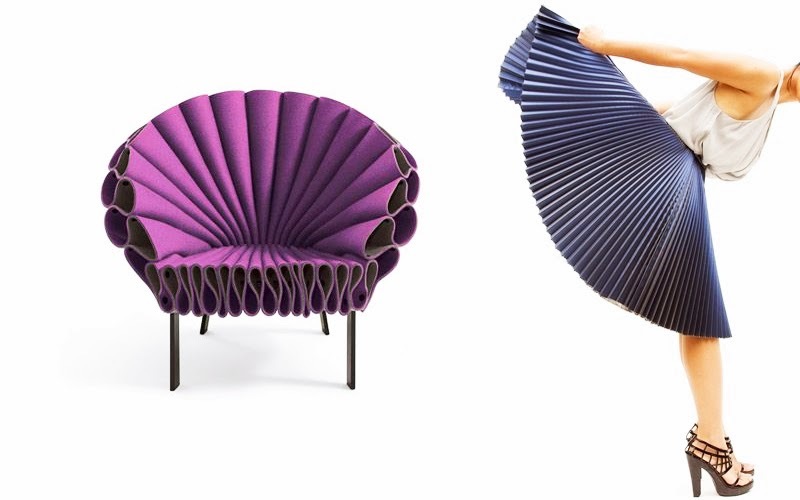 This plush Peacock Chair was brought to market by Cappellini and designed by a New York based designer Dror Benshetrit. The felt construction is quite ingenious, I wonder what its like to sit in? 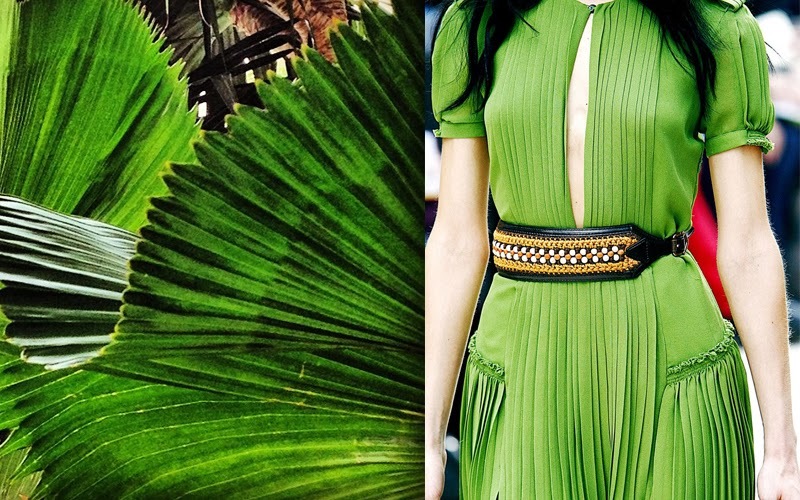 Nature's pleated plants provide inspiration for beautiful contrast for this Issey Miyake Pleats Please design. 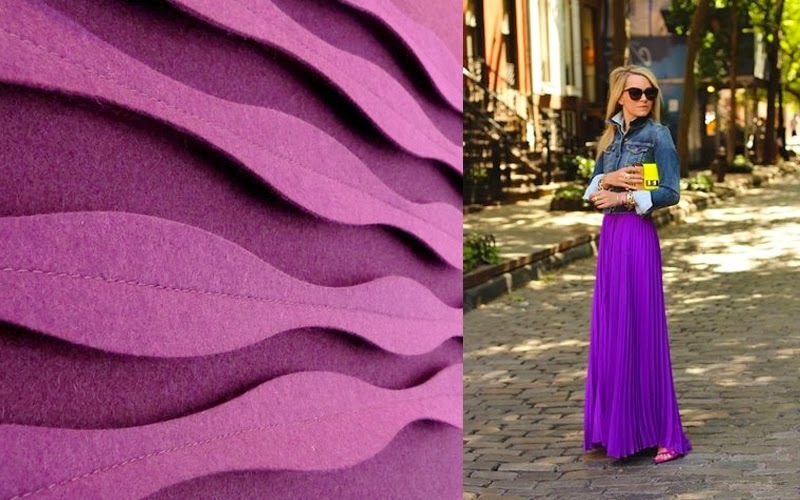 Pleat purple wall panel designed by Anne Kyyro Quinn not only provides a layered wall covering but also offers sound proofing and softening of acoustics in a room. 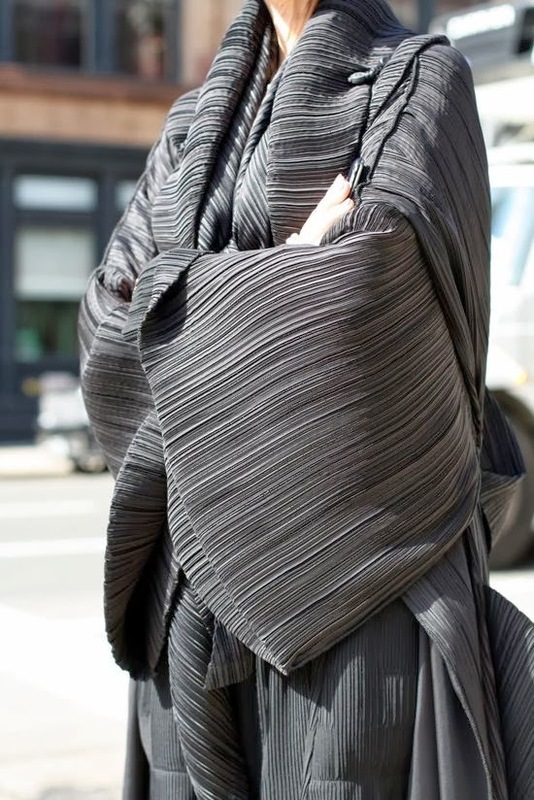 A post about pleats wouldn't be complete without mentioning Issey Miyake. 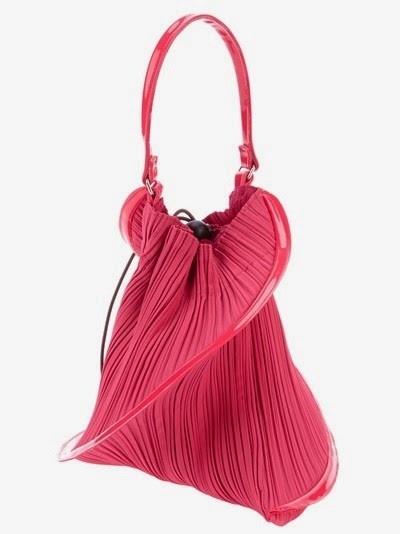 The Pleats Please range was introduced by Issey Miyake in 1989 and has been redeveloped every season since. He has beautifully captured that unique cross between functionality for every day comfort wear, beautiful design and utilizing the latest technology. When you think of pleats for the home, you probably think of pleated curtains or table cloths, but there is so much more! 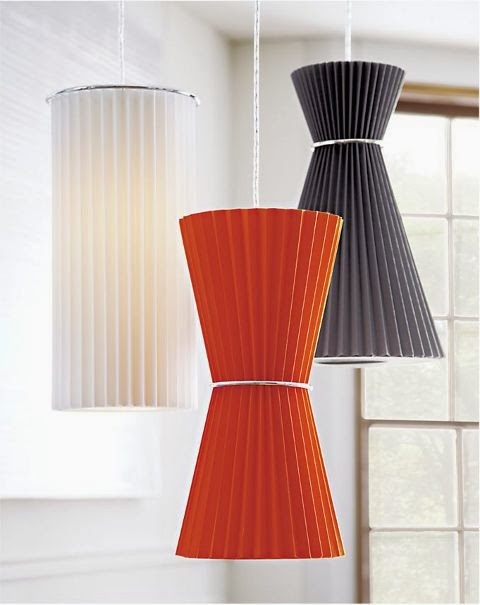 As with the above examples, the concept of pleats and folds can be applied to wall coverings, chairs, lamps and external cladding. 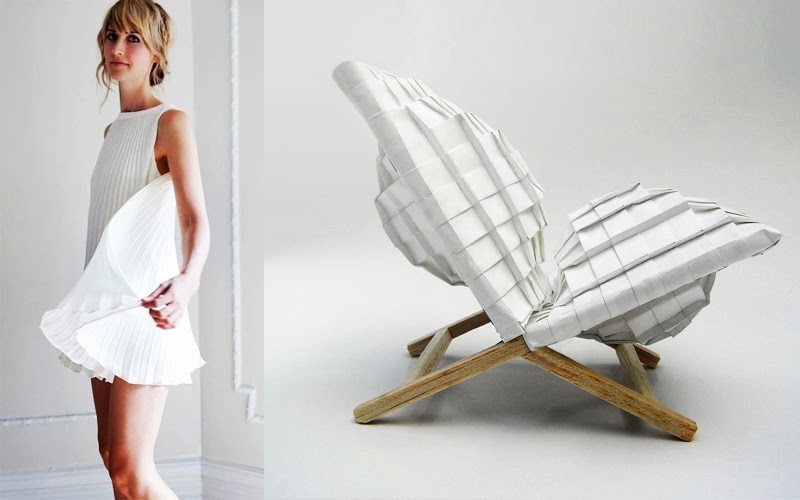 Sleek pleated wooden chair by Chris Hardy from Australia. So for a touch of sophistication this up an coming party season, try a pleated ensemble to elevate your look to another level of class. I leave you with one of my favorite pleated outfits right now, royal blue, rich velvet, pleated wide-leg pant, very regal.